This is the third part of a series of posts about my weekend trip to Donsol, Sorsogon for the Whaleshark experience. Previous posts in this series includes the budget for this Donsol trip (download Excel file here), and my musings about being back in Bicol after almost 6 years. 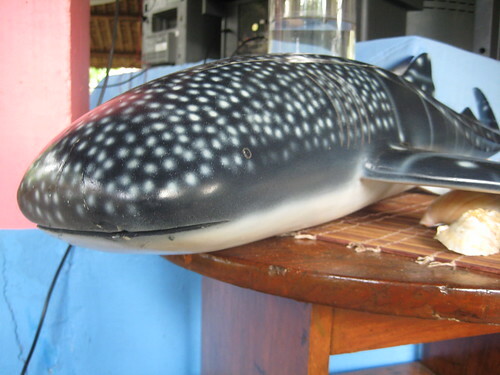 The Tourist Center is the starting point of the whale shark interaction experience. You are required to register and pay the interaction fee (Php100 for residents, Php300 for foreigners). This is also where you hire a boat, a crew and the Butanding Interaction Officer (BIO). Each boat is only allowed to carry 7 passengers (excluding the crew), and costs Php3,500 for the whole caboodle. If there are only two of you, the Php3,500 fee can be a huge amount, even if you split it. However, you can easily find and form a group of seven, since there’s a number of travelers traveling alone in these parts. I didn’t have an underwater camera so I will try to distract you with random photos like this. Owen and I were supposed to join the other guests from our resort. Due to a mix up, there were only one spot left in their group. Luckily, another group was also missing one passenger, so we decided to split and join the groups. Before heading out to sea, everyone is required to watch the video briefing. Basically, it tells you about the whale shark and the proper way of behaving during the interaction. Once you finish (or when your boat is ready), you board the boat to start looking for these gentle giants. The best time for butanding watching they say is between December to May, where there is less rain and more sunny days. It was uncharacteristically rainy that week in the Bicol region. Well, it rains in Bicol throughout the year, but we had some unusually hard rainfall that time. The skies were clearing up, but it was still overcast and drizzles every hour or so. Sunshine is important for whale shark watching; visibility is greatly reduced if the sun isn’t out. The interaction guidelines says that when one boat spots a whale shark, the other boats can’t go near and stalk the same whale shark. It also outlines that there can only be a certain number of people in the water at the same time. 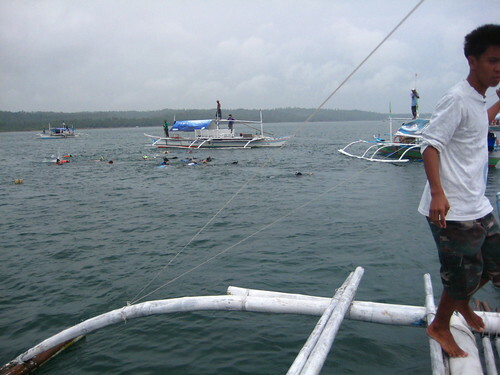 However, due to the weather and the poor visibility, the boats crowded around the same area, following the same butanding. Christine, who I saw at the Manila domestic airport and who has gone Butanding watching before, said that the whale shark would suddenly pop out of nowhere. Having a slight fear of drowning, I find this a bit disturbing. When we were in the water though, BIO Jun took my hand and swam with me to see the Butanding. He was pointing at something in the water and I was really straining to see what he was pointing at. Suddenly, out of nowhere, I see a grey shape dotted with spots. It’s a butanding! This is my only photo of the butanding. Pfft. But there’s always next time, right? It’s as if the sun suddenly came out from behind the clouds to give us additional meters of visibility. That and the butanding was swimming close to the surface. It was huge! It really was a sight to behold. Though I didn’t have an underwater camera with me (because I am an idiot), that’s one picture that I will always remember. We came back to the boat triumphant and exhilarated. We’ve already seen one, and we’re looking forward to see more! Our group saw a couple more after that, so by 11am, we were ready to head back to land. It really is a sight to behold!! I think I’d actually like to do it again sometime. Hopefully with my nephews, they’d get such a kick out of the experience! I dreamt of butandings last night lol I can’t wait to do it again! I’m sure every kid would be excited about this kind of experience. Hi an! Actually natatakot ako when I was thinking about it, while I was still on dry land. However, nung nasa boat na kami ang na-spot na nung guide yung Butanding, nawala na sa isip ko yung takot. They really are gentle creatures, and it swimming just below is (just watch out for his tail!) There are life vests on board naman if you need it. Have fun and enjoy your trip! Hey you! So my sib and co. are coming home this July and they want to hit a beach (if it doesn’t rain then) but there’s plenty of those in San Diego so I told them about you and your trip to Donsol. How you can swim with the ‘whales’. They’re sold on the idea. Oh di ba unique! Im a Donsolano. We are fortunate that we have this Gentle Giants that is why we did a lot of efforts for the conservation of our living treasure. Ty for the compliments, also this website. Those who wish to visit Donsol has a lot of infos about the tours and its particulars. 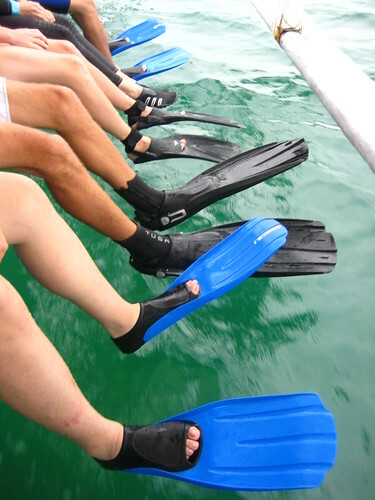 We would be very glad to see tourists with smiles after the whaleshark experience. Hi Nina, thanks for the site and space. What about a local tour of Albay and Sorsogon and see the majestic beauty of nature that Albay and Sorsgon offers? May i take this opportunity to invite you and everyone interested to come to Donsol to stay in AGULUZ HOMESTAY! It’s homey,nice, and comfortable place. It’s the best in town actually! It’s right at the heart of the town proper, just 5 minutes away from the Butanding interaction center by tricycle. Rate is affordable. An ac room with private bath is 1,700 pesos good for 4 pax; ac room with shared bath 1500php and fan room 800 php. 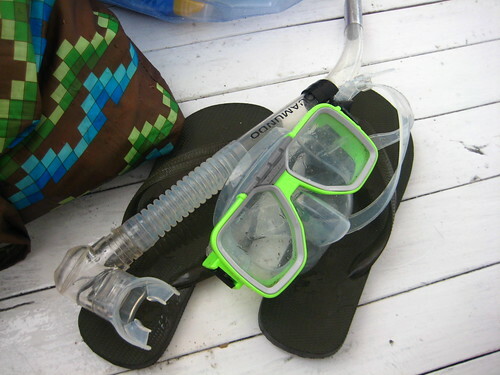 We offer food for your hearts delight; two-way transfer from Legaspi-Donsol-Leg; swimming gears; disposale camera (in case you forget again);advance booking for WS interaction;boats for river cruising and firefly watching; local tours to Albay and Sorsogon; Mayon trek; internet (with Scype account) and WIFI. My email ad is razomarilyn@yahoo.com and contact numbers at +639189420897 and +639209528170. Hope to see you all the next butanding season. I am Joel BIO. As the new Vice-President of Donsol Butanding Interaction Officers, I would like to invite everybody to come and visit Donsol to swim with our Whalesharks. Sure you will enjoy Donsol !!! Hi this is a funny and informative blog!! great job!!! Would you (or anyone) know if there are still Butandings by late June / early July? i really wanna see the Butandings!! You can take your chances, but the best time to see them is between March and April. I would like to invite everybody to come here in Donsol to enjoy our Butanding.